Plastic straws in the ocean are becoming a huge problem, and we as a society, are finally having to face this problem. It is reported that there is over 8.5 millions tonnes of plastic in our oceans, a number that is growing exponentially. A large portion of that number is made up of straws that were, more than likely, used for less that 5 minutes before being disregarded. If this article leaves you feeling a little depressed, fear not, I have written another (article) that focuses on the potential solutions we are turning to, to help reduce our realiance on plastic straws. This will hopefully lift your mood and show you that we are capable of turning this situation around…. as long as we all work together! In the US and UK Alone! Reports suggest that over 500 million straws are used in the US, every day!!! This means that for every American, there are around 1.5 straws, per day, being used and thrown away. Here in the UK, we reportedly use 8.5 billion straws per year, which is around 130 per person per year. Now, multiply that across the globe and you have some idea of the vast amount of single-use plastic straws that are being used every single day, on what is, essentially, a convenience product. With plastic straws being so small and lightweight, it is often difficult for a the mechanical recycling sorter to pick them out and they often end up with the normal garbage. Once this happens, there is much higher chance that the straws will end up in the ocean. There is also a large element of human error, whether that is from being thrown away incorrectly, littering or simply by being blown away during the stages of collection and recycling. Most of these straws will end up in city drainage systems or in coastal cities, can be blown directly into marinas, docks and the ocean. Globally, we only recycle around 14% of the plastic we produce, around 12% is incinerated and the rest ends up in landfills or in the ocean. Many countries need to step up their recycling efforts. You would expect developing countries to struggle to cope with the demands of recycling plastic, but the US is also a big contributor as they only recycle 9% of their plastic, a number which hasn’t increased since 2012. After China’s recent recycling ban, many counties are struggling to keep up with the new increase in demand. While in the long the run, this may push governments to increase their ability to recycle their own plastic waste, it could cause chaos until new procedures are put into place. 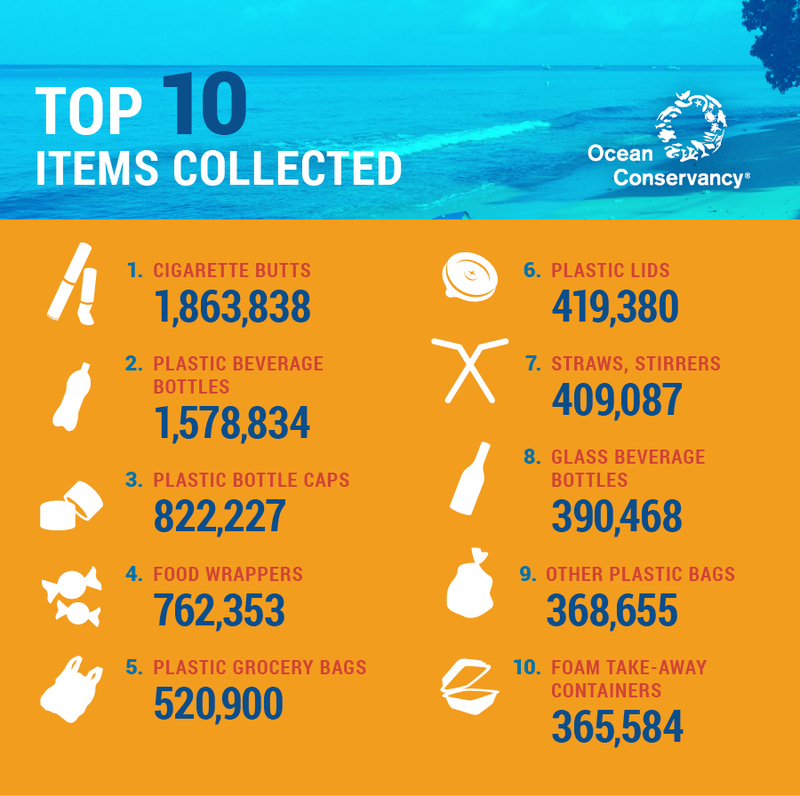 Plastic straws are also in the Top 10 list for items collected on beaches and waterways. This is another reason why we need to concentrate on eradicating any non-essential plastic use and why plastic straws are now being targeted in the fight against plastic waste. Plastic waste has a huge impact on marine life, from ingesting plastic particles and micro beads to being caught in nets and suffocating on plastic bags. Around 100,000 marine creatures die each year just from plastic entanglement, infants are killed by drinking their mother’s milk and many animals starve after they have ingested so many plastic bags they can no longer eat a sufficient amount of food. Plastic straws are one of the main plastic waste products and they come with their own problems for marine life to deal with. This video of a turtle with a straw stuck in its nostril has been watched over 32 million times. Whichever way you look at it, marine life is having a pretty tough time dealing with our plastic waste and it will get worse before it gets better. With billions of straws being produced, used and disregarded every year, we must act now to stem the flow of plastic straws making their way into the ocean. I honestly believe the tide is turning and we, as a society, are beginning to understand the consequences of using single-use plastics, which can only be a good thing. So that is my view on the problems that come with using plastics straws. I have also written an (article) on the potential solutions to our plastic straw crisis, where I go into detail about what companies are doing to play their part and I discuss government bans on plastic straws. If you have any comments or questions, please fell free to comment below and I will be happy to answer them all. Also. feel free to share this article with your friends and family if you feel it will help them understand the problems with using plastic straws. I can feel how marine life is struggling with the hazard human being did to them. Reading your post really made me feel so sad. What I am currently doing now is to reduce usage of plastics that include plastic bags, drinking straw and plastic spoon/fork. Can you share with me what else should I do to help the ocean? It’s great that you are already reducing your plastic usage! I have a couple of article that may help you further. 1. 15 easy ways to using plastic which will show you some of the easiest ways you can remove plastic from your day-to-day life. 2. 5 awesome ocean cleanup organizations which gives you some information how you can help in a more direct way. This is is very much needed website with amazing content and media within. A lot of people should see and understand the cause and effect of littering and dropping plastic waste into the ocean. Watching the video of them getting the straw from the sea turtles nose was heart breaking. There is no telling how long the straw has been inside her head and i could only imagine the amount of pain it caused. This was by far the most informative website that I’ve read. The niche that you chose is not only important, but it could be life saving.Please keep sharing and posting more content about the damages plastic has done to our Earth. Its HIGHLY appreciated and very much needed! I really glad you enjoyed the article and my website. It is definitely something close to my heart. The video of the turtle was really hard to watch and it’s hard to imagine how many other similar things are happening every day. You are definitely right about how the plastic materials are causing havoc to marine life. I watched a documentary about how plastics cause havoc in waters, to the marine animals and it is awful. Please continue to educate us otherwise we might just find ourselves with no sea life in future because of our doing. Plastic really is making life difficult for marine life, from plankton to whales! I will definitely continue to fight the good fight. It’s really making me sad reading about all these issues related to plastic straws!!! Hope we can all stop using these things that we just don’t need.